Art may imitate life from time to time, but here's a rare example of life imitating a video game. This collection of eerie images from an abandoned Spanish transport hub look cool in their own right, but what I found interesting about them was how they looked (to me at least!) like actual photographs of something you normally only see in something like Call of Duty or Battlefield. 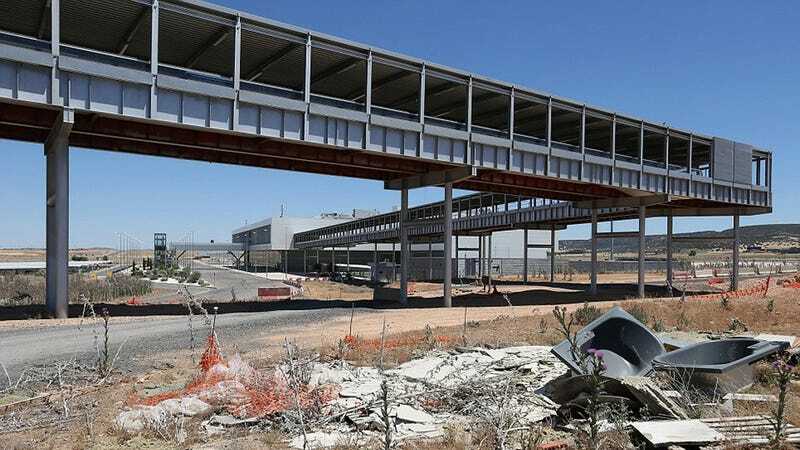 Ciudad Real's airport and high-speed rail terminal cost the Spanish government over €1 billion to build and market, and was opened in 2009 to much fanfare. Now, only three years later, it's a ghost town, the train station unfinished, the air terminals abandoned and walled off. It's a rotting monument to Spain's current financial meltdown. It also looks just like a Call of Duty map (or a map from any other modern military shooter). Take a look at the images. Just like a CoD map, despite being a pristine and enormous structure there's not a single wandering or otherwise innocent human being to be seen (though, occasionally, some guys have to paint giant warnings on the runway telling pilots they can't land there). No trace of life whatsoever. It's just...you, and the giant buildings, looking out, and that's it. It's the kind of place you'd set a level in. Sure, the world has no shortage of modern "ghost towns", especially in places like China, but endless rows of apartment buildings or abandoned skyscrapers are boring. A rotting airport, with terminal buildings and gangways and steps everywhere, that's exactly the kind of place, with exactly this kind of architecture, you find in a game like Battlefield or Call of Duty. There are also random, convenient piles of debris scattered all over the place. There's not a single mountain of garbage...just some concrete pipes over here, a waist-high pile of old bathtubs over there, all very clichéd shooter map window dressing (and handy if you were scrambling around in need of cover from intermittent gunfire). It's even fenced in, completing the illusion that it's a lifeless, enclosed "arena" (aka a video game) and not a part of the surrounding countryside (aka the rest of the planet). You can see more images, and read more about the doomed project, below.